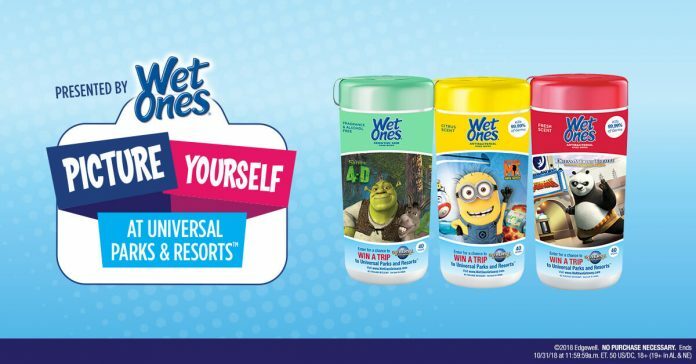 Wet Ones Getaway: Win A Trip To Universal Orlando Resort! Pack your bag with Wet Ones for a chance to win a trip to Universal Orlando Resort. You and your family could enjoy a 3-night trip for four to Universal Orlando Resort in Orlando, FL OR Universal Studios Hollywood in Universal City, CA including airfare, accommodations on-site at Loews Sapphire Falls Resort, admission to Universal Studios Florida and Universal’s Islands of Adventure theme parks, plus the all-new Universal’s Volcano Bay water them park, and more. Click “Enter Now” or “Click Here” to skip quiz and go directly to entry page. Follow the directions to complete and submit the online entry form with all requested information to receive one entry into the Sweepstakes. The Grand Prize consists of a four (4) day, three (3) night trip for Winner and up to three (3) guests to Universal Orlando Resort in Orlando, Florida. Trip will include: round trip economy class air transportation for Winner and up to three (3) Guests; three (3) nights standard hotel accommodation at Loews Sapphire Falls Resort; non-exclusive ground transportation to and from airport and hotel in Orlando, FL; 3-Park 3-Day Park-to-Park theme park tickets for admission to Universal Studios Florida and Universal’s Islands of Adventure theme parks and Universal’s Volcano Bay water theme park for Winner and up to three (3) Guests; and admission to one (1) Blue Man Group Show for Winner and up to three (3) Guests. The Approximate Retail Value of Prize is $3,576.19. Want to know more about the Wet Ones Picture Yourself at Universal Parks & Resorts Sweepstakes? Check out the details below. Open only to individual, legal residents of the 50 United States and the District of Columbia, who are 18 years of age or older as of the date of entry (19 or older in AL and NE) at the time of entry. Begins at 12:00:01 p.m. ET on 8/1/18 and ends at 11:59:59 a.m. ET on 10/31/18. Only one Sweepstakes Entry per person/email address per day will be accepted. On or about 11/5/18, one (1) winner will be selected in a random drawing that will be conducted by the Administrator from among all eligible Entries received to award the prize. For the name of the prize Winner, send an email to be received by 11/30/18 at 5:00:00 PM ET to: Winners@ASMnet.com and include “Wet Ones Picture Yourself at Universal” Sweepstakes in the subject line. Winner’s name will be sent after winner has been verified. The Sweepstakes is sponsored by Edgewell Personal Care Brands, LLC, 6 Research Dr., Shelton, CT 06484 and is being administrated by Advantage Solutions d/b/a IN Marketing Services, 501 Merritt 7, Norwalk, CT 06851. For complete details about this Wet Ones Sweepstakes, please read the official rules.